So, I don't know if you know, but I ADORE this series!! I LOVE IT SO MUCH!!! And I can't get enough of it! So I am excited to get to share my love for this series by participating in The Defiance Book Blitz hosted by Xpresso Book Tours! You can see my review of The Defiance, here. 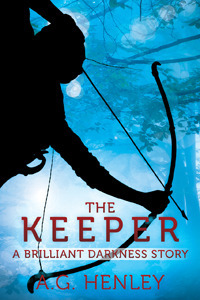 And my review of The Keeper, here. So first let me tell you a bit about the author! And here is a bit about the first book, THE SCOURGE!!! And then for those who are a bit to obsessed with the series (I am so not talking about myself!) There is a novella from Peree's POV!!!! What he doesn’t know is that he's falling in love with her. So, WHAT DO YOU THINK???? (That is actually one of my favorite scenes from the book!!!) Don't you want to go out and buy it??? Or BETTER YET, WIN IT??? Yes you guessed right! The author is giving away one KINDLE copy of THE DEFIANCE!!! YAY!!! So fill out the form below with the email you want it sent to! One (1) KINDLE copy of The Defiance, the SECOND book in The Brilliant Darkness series! A comment would be appreciated but not required. A winner will be picked August 29th and there e-book will be sent out after September 2nd!!! I'd never head of this series before, but it sounds very interesting. I'm always a sucker for people falling in love when they are usually enemies (or at least distrustful of each other).